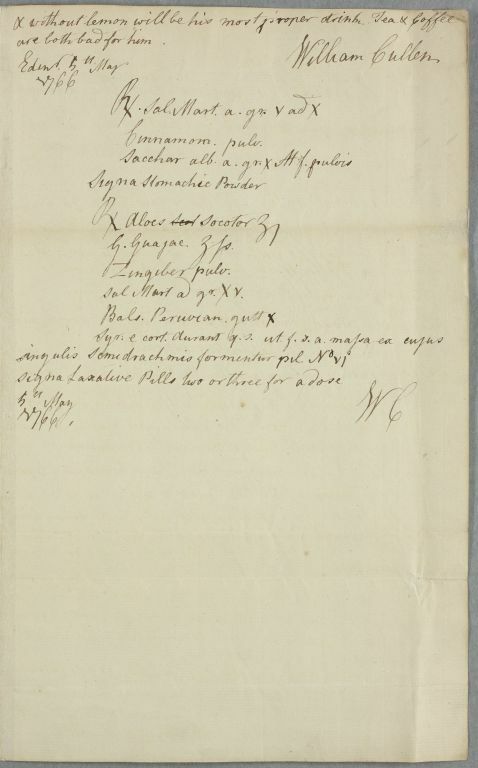 Reply, in form of loose neat draft copy, by Cullen for Mr Fabricius in Copenhagen, giving directions for his care and including recipes for 'stomachic powder' and 'laxative pills'. 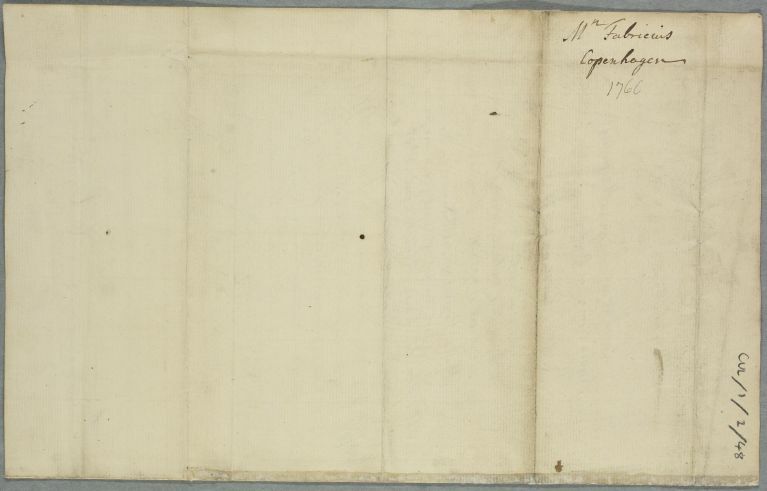 Addressee assumed to be Berger since this is Cullen's reply to Berger's enquiry of 29 March 1766 in Doc:777. 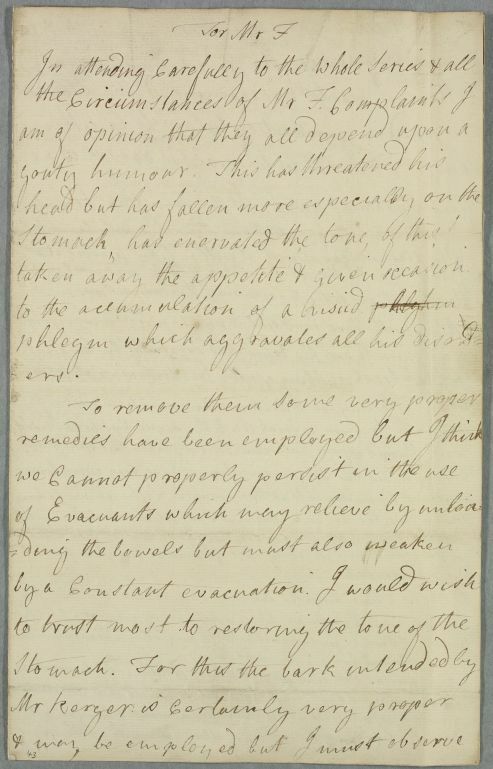 Summary Reply, in form of loose neat draft copy, by Cullen for Mr Fabricius in Copenhagen, giving directions for his care and including recipes for 'stomachic powder' and 'laxative pills'. 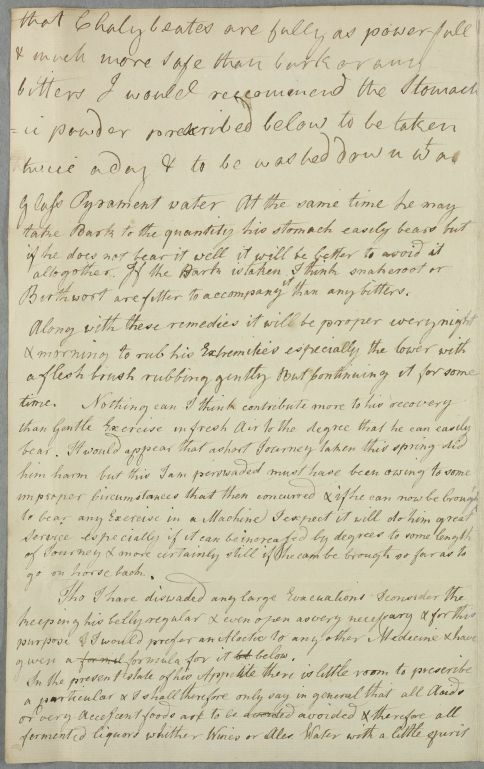 Addressee assumed to be Berger since this is Cullen's reply to Berger's enquiry of 29 March 1766 in Doc:777. Case of Mr Fabricius who is though to be 'gouty'. Birthwort are fitter to accompany than any bitters. given a formil formula for it bt below. are both bad for him. Take from five to ten grains of green vitriol [and?] powdered cinnamon, and ten grains of white sugar. Mix and powder. Label: Stomachic Powder. Take one drachm of Socoterine Aloes, half a drachm of Gum Guaiac, fifteen grains each of powdered Ginger and Green Vitriol, ten drops of Peruvian balsam, a sufficient quantity of Orange peel. Make into a mass out of which form six half-drachm pills. Label: Laxative Pills, two or three for a dose. sacchar alb. a. gr. x. ℳ et pulvis.